Shortly after Egypt launched the first Arabic Top Level Domain (TLD), the United Arab Emirates launches the first .emarat (.امارات) TLD. 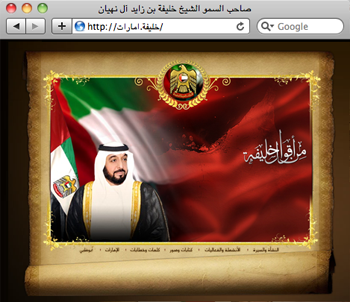 Head out to http://خليفة.امارات (khalifa.emarat), the official website of the UAE President Sheikh Khalifa bin Zayed Al Nahyan, and check it out. Typing this is going to feel weird for a while! The UAE has become one of the four countries so far, allowed by the Internet Corporation Assigned for Names and Numbers (ICCAN), to use the internet domain in its mother tongue. Although the UAE’s Telecommunications Regulatory Authority’s plan is to “encourage all companies and entities in the UAE to register for .ae and .emarat as it represents their local business identity and brings their country pride,” no information about how or when registration can take place has been announced yet.